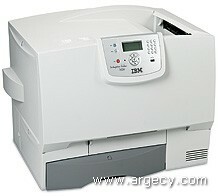 Looking for IBM Infoprint 1654 & 1664 Parts? Leasing Available from $9.37 per month! The IBM 4930 Infoprint Color 1664 is a replacement for IBM Infoprint Color 1464 workgroup printers. This printer offers faster printing of up to 25 pages per minute (PPM)(1) letter size, up to 24 PPM(1) A4 size, for color and monochrome printing. It offers a high-quality, medium-volume color print solution with flexible paper handling and networking options. The Infoprint Color 1664 comes with 10,000-print toner cartridge and a wide range of paper handling options. The 4930 Infoprint Color 1664 MFP Express Model n01 comes with a 800 MHz Freescale 7448 processor, 256 MB memory standard (768 MB maximum), 10/100BaseTX Ethernet, and first-page-out time of 13.0 seconds for monochrome and 15.0 for color. Duplex printing capability is optional. The 4930 Infoprint Color 1664 MFP Express Model dn1 comes with a 800MHz Freescale 7448 processor, 256 MB memory standard (768 MB maximum), 10/100BaseTX Ethernet, and first-page-out time of 13.0 seconds for monochrome and 15.0 for color. Duplex printing capability is standard. Infoprint Color 1654 Express is a lower-cost version of the Infoprint Color 1664. It ships with a 6,000-print toner cartridge (versus a 10,000-print cartridge for Infoprint Color 1664). Infoprint Color 1654 supports fewer media handling features than the Infoprint Color 1664. Infoprint Color 1654 Express cannot be upgraded to an Infoprint Color 1664. All models come with a 500-sheet drawer and 100-sheet multipurpose feeder (MPF) for a total input capacity of 600-sheets standard. An optional 500-sheet drawer is available for a maximum input capacity of 1,100 sheets. Output capacity for all models is 250 sheets. Optional duplex is available for models that don't have it standard. All models come with a 500-sheet drawer and 100-sheet multipurpose feeder (MPF) for a total input capacity of 600-sheets standard. Up to three optional 500-sheet drawers or one 500-sheet drawer and one 2000-sheet drawer are available for a maximum input capacity of 3,100 sheets. An optional envelope drawer, outdoor media drawer, and banner tray are also available. Optional duplex is available for models that don't have it standard. Standard output capacity for all models is 250 sheets. An optional output expander, 5-bin mailbox, and StapleSmart finisher are available. Maximum output capacity is 1,000 sheets. The controller has one slot for memory DIMMs, one slot for flash cards, one slot for application solution cards, one slot interface cards, and one slot for hard disk adapter. All models come with 256 MB of memory soldered onboard and can support a maximum of 768 MB of memory with one 512 MB DIMM installed. Flash memory up to 64 MB is supported using the flash memory DIMMs. A optional 40 GB+ hard disk is available. The maximum monthly usage for the Infoprint Color 1654 Express is 100,000 impressions. The maximum monthly usage for the Infoprint Color 1664 is 120,000 impressions. IBM does not recommend printing to the monthly maximum on a consistent basis. Infoprint Color 1654 Express and 1664 will have 5 toner darkness levels for color and monochrome. The printer will ship with printer darkness set at 4. When printing in color, level 5 is equal to level 4. The "Toner Darkness" menu is available through the operator panel under the Quality menu and also accessible through the PostScript or PCL driver. Note: The Infoprint Color 1654 Express is a lower-cost version of the Infoprint Color 1664. It ships with a 3,000-print toner cartridge (versus a 6,000-print cartridge for the Infoprint Color 1664). The Infoprint Color 1654 Express supports fewer media handling features than the Infoprint Color 1664. Note: The Infoprint Color 1654 Express cannot be upgraded to an Infoprint Color 1664. The following table specifies maximum throughput based on resolution and media size. For a complete range of media sizes supported, see Media Supported table. Note: For media sizes smaller than those listed below, the "narrow media" paper type should be selected. Throughput may be reduced for narrow media in some circumstances to protect the printer from thermal damage. Note: (1) The first narrow pages print at rated engine speed; subsequent pages print at the speed shown. Note: (2) Once the printer enters a reduced throughput mode as indicated the printer remains at the given speed after the last sheet of non full-sized media untill the fuser returns to standby temp. Note: (1) The first (25) narrow pages print at rated MPF speed, subsequent pages print at the speed shown. Note: (2) All envelope sizes print at 1200 dpi process speeds shown. First Copy Times are shown in the following table. Note: (1) All first copy times are measured for 4800CQ simplex printing on letter sized paper. The test job consists of a single page of simple text (approximately 20% coverage). The first copy time is defined as the elapsed time from hitting enter on the PC keyboard to the page exiting to the output bin. All tests will pick paper from the default primary input tray and the page will exit into the default primary output bin. Times may be longer if an automatic calibration is required. The Infoprint Color 1654/1664 printable area is limited to within 4.2 mm (0.167 in.) of top, bottom, left or right edges of the media. Any information placed outside this specified printable area will not print. Customer-replaceable maintenance items are recommended every 200,000 pages for the fuser and 120,000 pages for the ITU. The Infoprint Color 1654/1664 performs an automatic calibration under the following conditions: 1. at power on, 2. after 8 hours of Power Saver, 3. every 500 pages, 4. after changing a print cartridge, or 5. after changing an intermediate transfer unit. A manual calibration can be initiated by selecting "Color Adjust" from the Color Menu. The Infoprint Color 1654/1664 will offer several controls that will allow the user or Printer / Network Administrators to direct the preferred output to be Color or Black & White. A choice to print a color job in black & white is available in Infoprint Color 1654/1664 Drivers. Printing jobs in color is the default setting. Infoprint Color 1654/1664 will offer a Black only driver (Windows NT 4.0, XP, 2000, Windows Server 2003) that will allow Printer / Network Administrators to limit the printing from some workstations to black and white only. Allows users not utilizing an Infoprint Color 1654/1664 Driver to print a color job in black & white by selecting Black & White from the menu. The selections are Color (default setting) and Black & White. "Print Mode" is located under the Color Menu. These Op panel selections are ignored when using an Infoprint Color 1654/1664 Driver for Windows. Printer Usage modes are set to control the starting position of the Intermediate Transfer Unit (ITU) and how the printer software controls its position depending on the color content of the print job and/or the Infoprint Color 1654/1664 Driver or "Print Mode" selection. There are two selections: Max Speed and Max Yield (default setting). "Printer Usage" is located under the Setup Menu. Processing a significant number of black pages with the ITU engaged may reduce the life of the color photoconductors and may affect the ultimate life of the color print cartridges (the photoconductor is an integral part of the cartridge). Maximum print speed is obtained when the Driver and Print Mode are set to color (default settings) and Printer Usage is set to Max Speed. Any other selections can reduce throughput depending on the job content and the selection. It takes approximately one second to lower the ITU and approximately six seconds to raise it. The following table summarizes the effect of selections on the ITU movement. This feature allows Printer/Network Administrators to "lock" the Infoprint Color 1654/1664 printer in a mode that will only print black 1 white with the ITU disengaged. This feature can not be overridden with any other menu or driver selection. "Black and White Lock" is located under the Setup Menu. Print Permissions allows customers to configure the Infoprint Color 1654/1664 to only print color for certain approved network user IDs. MarkVision will host a utility that allows IT administrators to enter user ID exceptions to normal printing function. User ID specific permissions are entered and stored in the printer. They can be updated at any time and as many times as customers wish. The list is limited to 100 user IDs per printer. The list is intended to be an exceptions list. (i.e. if normal use allows color printing for most people the list can be used to exclude certain users from color printing). Conversely, normal usage could be no color printing and the list is used to allow color printing for select users who have demonstrated a business need to print color. Infoprint Color 1654/1664 will have 5 Toner Darkness levels for color and mono. The printer will ship with Printer Darkness set at 4. When printing in color, level 5 is equal to level 4. The Toner Darkness menu is available through the operator panel under the Print Quality menu and also accessible through the IBM PostScript or PCL Driver. Allows users to customize color correction output from the Op Panel. Note: (1) US CMYK is default for low volt printers, Euro CMYK is default for high volt printers. Applies color correction to approximate SWOP R color output. The Infoprint Color 1654/1664 will offer a Color Balance Control. It is a color correction option that allows the user to increase or decrease the amount of toner going to the page individually for the cyan, magenta, yellow and black color planes. The scale for the adjustments is +5 to -5. The Infoprint Color 1654/1664 will offer a Color Saver Mode that allows end users to print images and graphics lighter. Text will print at Toner Darkness "4", while images and graphics print at Toner Darkness "1". The Color Saver Mode is located on the Op panel under the Color Menu and may be selected from the IBM Custom PostScript or PCL Driver. To assist users in selecting the colors to be printed, they can print color sample pages for each of the RGB and CMYK color conversion tables used in the printer. The color sample pages consist of a series of colored boxes along with the RGB and CMYK combination that creates the color observed for each particular box. These pages can be useful in helping users decide which RGB or CMYK combinations to use in their software applications to create the desired printed color output. There are 88 symbol sets in the PCL 6 emulation to support all the languages that use these characters. The symbol set names are listed below. Not all symbol sets are supported by all fonts. Refer to the Technical Reference manual on Publications CD or use the printer operator panel to find which symbol sets are supported by each font. The Infoprint Color 1654/1664 will have UTF-8 code support standard. UTF-8 code is a particular way in which fonts are accessed. UTF-8 code is a particular way in which fonts are accessed. UTF-8 is available for PCL and PostScript fonts. The fonts in the PCL 6 emulation are compatible with the fonts in the HP4600 (HP trademark) and include nine additional fonts and many extra symbol sets to support extra languages and applications. The fonts in the PostScript emulation are compatible with Adobe PostScript 3 and include 20 additional fonts above and beyond the Adobe PostScript 3 fonts. Additional fonts can be downloaded to the printer RAM or optional Flash DIMM or Hard Disk. PCL emulation supports both scalable and bitmapped downloadable fonts. PostScript emulation supports only downloadable scalable fonts, and PPDS emulation supports only downloadable bitmapped fonts. Font cards and font cartridges are not supported. Included on the CD-ROM shipped with the printer are a variety of downloadable fonts for Hebrew and Arabic and additional support for the Euro currency character. resident scalable fonts. All models come standard with one 500-sheet paper drawer and a 100-sheet multipurpose feeder. One 250-sheet output bin is standard. See tables below for standard and maximum media capacities. Note: (1) A maximum combination of three optional 500-sheet drawers or a maximum combination of one optional 500-sheet drawer plus one 2,000-sheet drawer is supported on any model. Note: A maximum of one 5-Bin Mailbox, Output Expander, or Finisher is supported. Note: An optional 500-sheet drawer is required when utilizing a 2,000-sheet Drawer and a Duplex Unit. The first option under a duplex unit must be a 500-sheet drawer. Note: (1) Size 98.4x162mm to 176x250mm (3.87x6.38 in. to 6.93x9.84 in.). Note: (2) Size 139.7x210mm to 215x355.6mm (5.5x8.27 in. to 8.5x14 in.). Note: (3) Size 76.2x127mm to 229x355.6mm (3.0x5 in. to 9.01x14 in.). Note: (4) Size 148x182mm to 215.9x355.6mm (5.83x7.17 in. to 8.5x14 in.). Note: (5) Occasional use only. Note: (6) Narrow media should be loaded with the length in the feed direction (portrait). Note: (1) For 60 to 176 g/m2 paper, grain long fibers are recommended. For papers heavier than 176 g/m2, grain short is preferred. Note: (2) Paper less than 75 gsm is limited to simplex only at less than 60% relaative humidity and is not supported in duplex. Paper less than 75 gsm must be printed with paper weight set to light. Note: (3) Pressure sensitive area must enter the printer first. Note: (4) 100% cotton content maximum weight is 24 lb. bond. Note: (5) 28 lb bond envelopes are limited to 25% cotton content. Note: (6) The duplex option supports the same weights and types as the printer except for 16-19.9 lb (60-74.9 gsm) grain long bond, A5, cardstock, transparencies, envelopes, and paper labels. Note: (7) Occasional use only. Note: (8) For envelopes, Envelope Drawer has same support as MPF. Note: (9) Paper 120 to 176 gsm (32 to 47 lb) must be printed with Paper Weight set to heavy. Note: (2) Paper less than 75 gsm is limited to simplex only at less than 60% relative humidity and is not supported in duplex. Paper less than 75 gsm must be printed with paper weight set to light. Note: (1) 120 gsm (32 lb.) banner paper must be printed with Paper Weight set to Heavy. Preprinted forms and letterheads must be able to withstand 170 degrees C (338 degrees F) fusing temperature and should be selected using guidelines found in the printer User's Guide. The chemical process used in preprinting may render some papers unsuitable for use with the Infoprint Color 1654 and 1664. Unsuitable papers include multipart forms and documents; chemically treated papers; coated, synthetic and thermal papers, A5 paper less than 80 gsm recycled paper less than 75 gsm; and preprinted papers requiring a high degree of registration. Recycled paper less than 80gsm (21lb) may cause unacceptable results. Transparencies specifically designed for xerographic copy machines or laser printers may be used with the Infoprint Color 1654 and 1664. Note: Microcode updates and User's Guides are available from the IBM web site. Note: See the appropriate User's Guide for configuration instructions. Note: When the printer is emulating an IBM printer, the function supported depends on the IBM host software. The optional MarkNet print servers support Ethernet 10BaseT/10Base2 and Ethernet 100BaseTX/10BaseT with the following Network Operating Systems: Novell NetWare (including NetWare Directory Services - NDS and NDPS), Microsoft Windows NT 4.0 Server, Microsoft Windows 2000 Server and Advanced Server, EtherTalk, and the following UNIX platforms: Caldera OpenLinux, IBM AIX, Compaq Tru64 (Digital), HP-UX, Red Hat Linux, SCO OpenServer, UnixWare, SGI IRIX, Sun Solaris, Sun Solaris x86, SuSE Linux and TurboLinux. Note: MarkNet N2000 microcode level 3.15.x or later is required for SCS/TNe support. Note: For OptraImage network ports, microcode level 5.15.x or later is required for SCS/TNe support. Note: Any MarkNet X2000 microcode level provides AFP/IPDS support only. Note: For IPDS printing, a minimum of 16MB of printer memory is required. Note: With OS/400 V5R2, to print IPDS over TCP/IP through PSF/400. Note: Up to four (4) TN5250e sessions from multiple hosts are supported; however the SCS Menu options settings for all 4 sessions are the same. The following sections highlight the approvals and certifications that Infoprint Color 1654/1664 are expected to receive. Direct USB printing allows individuals to print supported files directly to the printer using an approved USB flash memory device. Supported file types include: pdf, gif, jpeg, jpg, bmp, png, tiff, tif, pcx, and dcx. Through the printers USB Direct interface located on the printer's operator panel, a user can simply insert the USB flash memory device, select the appropriate file and choose to print the file on this specific printer. In addition to the above hardware requirements, PDF files used with Direct USB printing must support PDF standard version 1.5 or earlier. PDF files with restricted printing permissions or encryption are not supported. MarkVision Professional for Windows and Sun Solaris, SuSE Linux, Red Hat Linux, HP-UX and IBM AIX operating systems are available from the Website www.Markvisionprofessional.com. The Windows software applications, which operate in the operating systems listed below, are best suited to run with the drivers supplied with the printer. These drivers for Windows take advantage of your printer functions and increase the printer performance wherever possible. -Microsoft Windows 2000 Server running Terminal Serv. -Microsoft Windows 2003 Server running Terminal Serv. Note: (1) Download the latest MFP drivers from the IBM Web Site. Note: (2) IBM Printing Solution is only available from the IBM Web Site. Note: (3) Printer drivers for UNIX that are shipped on the Drivers and Utilities CD. Note: (4) Printer driver support only. No support from IBM utilities. Driver must be installed using Windows Add Printer Wizard. Note: (5) Printer drivers for Linux that are shipped on the Drivers and Utilities CD. Note: (7) IBM may not offer printer drivers for thee systems. Note: (8) Support for these operating systems only available from the IBM Web Site. Note: (10) System driver support only, no custom driver support. MarkVision Professional, MarkVision Messenger are available from website www.markvisionprofessional.com. NetPnP and Software Installation and Distribution tools are provided on Drivers, and Utilities CDs. In Windows NT 4.0 and Windows 2000, Windows XP or Windows Server 2003 environments, these tools enable administrators to push printer software installation to other Windows NT 4.0 or Windows 2000 workstations, Windows XP, Windows Server 2003 or to write a script that will install specified printer software on specified Windows NT 4.0, Windows XP, or Windows Server 2003 on the network. When executed, these scripts will silently install all specified IBM software. NPRU will not support the Infoprint Color 1654/1664. This utility will not support the Infoprint Color 1654/1664. Note: (1) Weights for low-voltage and high-voltage models are the same. Note: (1) Allow 1219.2 mm (48 in.) clearance to the left if you will be adding a Banner option to the printer. Note: (2) Allow clearance above the printer for front door operation and for adding options, such as additional input drawers, output expander or 5-bin mailbox. All printer features are customer installable. FC = feature code. This input option can be installed beneath the printer to offer an added input source which holds approximately 500 sheets of 20 lb. paper. For customer environments with space or budget constraints that would prevent purchase of the complete input drawer option, a separate tray option is available. Drawer includes tray plus support unit. For example, the tray might hold an alternate media, such as letterhead, and temporarily replace a tray with standard media as needed. This version of the tray holds approximately 500 sheets of (20 lb.) paper. This input option can be installed beneath the printer to offer an added input source which holds approximately 2,000 sheets of 20 lb. paper. This feature installs beneath the printer and hold approximately 60 envelopes (20 lb., 75 gsm). This output option offers five output destinations in one. Each of the 5 bins on this option supports approximately 100 pages (20 lb) of paper. This feature offers stapling, offsetting, and an additional output bin. It can support up to 750 sheets of unstapled media. For stapled media, the output bin supports up to 40 stapled sets or 600 sheets. The stapler can staple a maximum of 25 sheets per set. The staple cartridge contains 3000 staples. The finisher has two handy storage compartments for storing extra staple cartridges. This feature has been especially designed for use in printing on a polyester media used for outdoor signs. This heavy duty outdoor media is available in Letter or A4 sizes. The option ships with a sample pack of the outdoor media. It is recommended that this option not be used in conjunction with other optional input devices. The Banner Tray feature is an extension of the Multi Purpose Feeder and allows the automatic feeding up to 50 sheets of 24 lb. (90 g/m2) banner paper up to 8.27 inches wide x 48 inches long (210mm x 1219.2mm). It also serves as an extension of the output tray, to hold the printed banner paper as it exits from the printer. The banner media tray is easily installed and features a fold-down tray for space savings when not in use. All media which can be fed from the Multi Purpose Feeder can be used when the Banner Tray is attached. 50 sheets of 24 lb (90 g/m2) paper is the maximum input and output of banner paper supported using the Banner Tray. Banner paper is not supported using duplex mode. The option ships with a box of the Banner Paper. The Infoprint Color 1654/1664 has one slot for DRAM memory and one slot for flash memory features. A maximum of 768 MB of memory and 64 MB of flash memory is supported. The printer has one slot for an optional hard disk with adapter feature. In addition to the standard USB port for all models, each Infoprint Color 1654/1664 model has one interface slot that can be used for optional local connections or network connections. This card provides an RS 232-C serial port. This adapter allows an RS-232C Serial/Parallel port with a type C connector (1284-C) to accept a cable with a type B connector (1284-B). This card provides a Gigabit Ethernet connection over CAT-5 cabling. For parallel attachment, this cable is recommended for ten feet or less and must be ordered separately. This external print server has one USB port to connect to an Ethernet 10BaseT/100BaseTX network. This external print server has four USB ports to connect up to four printers to an Ethernet 10BaseT/100BaseTX network. This external print server has one parallel port to connect to an Ethernet 10BaseT/100BaseTX network. This feature allows the printer to be connected directly to a wireless LAN using the IEEE 802.11g wireless standard. This standard operates at speeds of up to 54 megabits per second (Mbps). The range of this wireless adapter depends on the environment, whether used indoors or outdoors and building contruction. Typical indoor ranges are 20-50 meters and outdoor ranges are 100-200 meters. Performance will degrade with distance. The wireless LAN feature is compliant with any WiFi-compliant device. The feature is an external adapter that connects to the USB port on the printer. Printer stand is not used with 2,000-Sheet Drawer. Printer stand is required when three additional 500-sheet trays are used. The internal and external network adapters support Network Plug and Print 2.0 on Windows NT 4.0 and Windows 2000 systems. The printer with standard Ethernet internal print servers and external print servers support a Resident Web page with Microsoft Internet Explorer 5.x or later and Netscape Navigator 4.5 or later, Apple Safari 1.0 or later, Mozilla Firefox 1.0 (or later). The remote operator panel is available from internal and external print servers. These features plug into the one Application solution slot. The Bar Code Card Card enables the Infoprint Color 1654/1664 to print more than forty seven of the most popular industry standard bar codes, including Datamatrix, QR Code, Aztec, microPDF417, PLANET, Codablock F, ITF14, and HIBC128. The Bar Code Card card generates bar codes algorithmically for improved readability. The Bar Code Card Card emulates HP printers with an HP BarCodes & More font solution, JetCAPS BarDIMM or JetCAPS BarSIMM (v. 2.0b). Capturing bitmap or outline fonts to hard disk or to flash memory resulting in reduced network traffic over LAN. Supports IPDS color commands. The colors are transformed to black or shades of gray, based upon the IPDS menu Color Mode setting. IPDS N-ups and N-up Explicit Page Placement support. Print 1 to 4 pages per side or up to 8 pages per sheet when printing duplex. Download DBCS outline and bitmap fonts from the host in IPDS. Support for Simplified Chinese, Traditional Chinese, Korean and Japanese is provided. Automatic resolution sensing for IPDS when the Host Resolution menu is set to Auto. Selecting Auto allows 240, 300 and 600 dpi resources to be downloaded from the host. Product Identifier Self Defining Field Information is returned to the host with IPDS. Device type, serial number , device code levels and device name are returned to the host. These may be displayed at the host to aid in device location and maintenance. With the TN3270E and TN5250E extended Telnet protocol support in these options, the printer emulates one TN3270E printer session and up to 4 TN5250E printer sessions using the LU1 SCS data stream over TCP/IP. This is supported directly from an iSeries or from a mainframe using TCP/IP or through any TN3270E capable gateway that supports TN3270E according to RFC 2355. The DSC/DSE or SCS data streams over LU3 or LU0 are not supported. The Telnet protocol function is only supported with through the standard Ethernet network port. See the compatibility section for more details. The printer can be configured to take advantage of additional RAM, and when attached to a LAN through the standard Ethernet port can save IPDS resources to improve performance for complex IPDS print jobs with host resources such as fonts, overlays or page segments. DBCS characters in Traditional Chinese, Simplified Chinese, Korean, and Japanese can be downloaded and printed from the host. DBCS fonts may be stored in flash memory or hard disk using the Font Capture feature to reduce network traffic and transmission time. The separate DBCS Fonts Cards canot be used in conjunction with the Card for IPDS and SCS/TNe. The Card for IPDS and SCS/TNe cannot be used in the Infoprint Color 1654/1664 laser printer in conjunction with the Bar Code Card. The IPDS emulation supports the IPDS data and resource towers. Fonts can be downloaded, captured and saved to hard disk or flash memory in the printer. The US Postal Service POSTNET barcode, PLANET barcode and the euro currency symbol are supported within IPDS.